What could be more unfortunate and destructive for a business than a fire! Sometimes all is lost. Fortunately, however, thanks to firefighters' speedy interventions, most fires do not result in total structural loss. Phoenix understands your situation, and has the expertise to help you return to your affairs without delay. 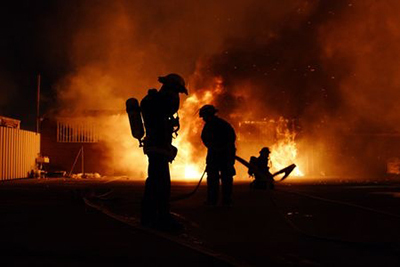 Fires cause damages such as smoke, soot, odors, and usually the firefighters leave water damage. 2) First, even if we are on-site right away, we must wait for the approval of the firefighters and the police before beginning cleaning. During this time, we can prepare our equipment and discuss your main concerns relating to the intervention. first hours are critical in terms of limiting damages, which is why you need the services of a company like Phoenix that is able to mobilize a large team very quickly. With the help of specialized equipment such as thermo-graphic cameras we can make the most of those precious first hours at the start of an intervention. These time-savers are felt throughout the entire intervention. As soon as possible, a team will take a full inventory and do a triage of which damaged articles are losses and which can be saved. In some instances we must bring your belongings to our warehouses to proceed with their cleaning and/or drying. If this is the case, each article is carefully packaged and identified with the client's name. If some of your clothes have been affected, we can send them to the dry cleaners, just as we can send any damaged electronic equipment to be verified by a technician. Our team, a building evaluator, and you, must evaluate the structure of the building. A triage is then done: the structures and materials to be restored are identified; those to be replaced are removed. Next, we clean all the rooms that were exposed to smoke or soot, and we treat them for Contact us now!